A site with a lot of information from the war in Russia and many documentation of the Russian AFV's. A few time ago I receive from my friend Kees van Meel an (bad) copy from a article with WW-II "Russian Hetzers", which I never have seen. The article was publiced in the Russian Hobby Magazine "POLIGON" #3, 2001. With help from Roy Mudway from Australia I become a new (good) copy. The article is translated by James F. Gebhardt, with help from the people from the Russian Website "Russian Battlefield" and also publiced. There is hardly a fan of armoured vehicle who, upon hearing the name "Hetzer", would not conjure up an image of that vehicle. This low "coffin", armed with a powerful 75 mm gun, became one of the most successful combat vehicles of the Third Reich. Many current tank fans who give due respect to this self-propelled gun, react disparagingly to domestic light SP-Guns and their creators, ostensibly for having not given thought to such a project. On the contrary, these designers were actively working on similar SP-Guns in the USSR, and in fact began these efforts much earlier than in fascist Germany. Strictly speaking, the history of the Soviet SP-Gun tank killer began in April 1941, even before the invasion by fascist Germany. At a session of the KO SNK of the USSR, plans were being discussed for the production of the T-50 Main Battle Tank> for the current year. Marshall G. Kulik was present and expressed the concern about the 57 mm tank gun not being prepared for the T-50 tank. He raised the issue of "the development on the T-50 chassis of a tank destroyer, armed with a 57 mm high velocity type-1941 (ZiS-2), as well an anti-aircraft tank with 25 mm, or 37 mm automatic gun for protection of tank units on the march and in deployment against attacks by enemy tanks and aircraft." "The realization of the T-50 tank killer with a revolving turret, with the specified tactical and technical parameters, is not deemed possible at the present time without significant reconfiguration of the hull and redesign of a large number of components. This will require significant expenditure of time and material resources. The rapid realization of the assigned task can be achieved satisfactorily if a revolving turret were to be abandoned and the tank killer were to be developed in a turretless form. This will permit a high degree of protection for the crew behind armour plate positioned at shallow slope angles and will not hinder the employment of the vehicle. The 57 mm high velocity gun can be mounted in the front glacis of the tank or in a special armoured housing with the possibility of conducting fire in the horizontal plane to 45 degrees [22.5 degrees to the left and right of the centre line - V.Potapov]. The commander's cupola must be retained. Undoubtedly, the absence on this tank killer of a revolving turret is one of its deficiencies. However, this case can speed the development significantly and meet the strict timetables laid down by Comrade Narkom [Kulik]. This turretless tank will undoubtedly be significantly more powerful, cheaper, hardly spotted, and lighter than any other modern tank that exists in the inventory of the Red Army." Unfortunately, no images of the design of this Soviet "Hetzer" have been found, nor any documentation of the decisions made regarding it, by the higher authorities. With the start of the war, Plant #174 was consumed by the hurried production of the T-50 tank, and then was evacuated twice. As a result, no subsequent work was conducted on this tank killer. A few words should be said regarding the power plant of the T-50 tank. A special in-line diesel engine V-3 was developed in 1940, which was "one-half" of the famous V-2. The V-3 was to be installed in light tanks and tracked prime movers from 1941-42. Among the deficiencies of the V-3 engine identified by designers, was the requirement for a vertical alignment would complicate its installation in the hulls of light tanks. With a working displacement of 11.9 litres and nominal output of 225 hp at 1750 rpm, this engine was very attractive to Soviet industry in view of its high degree of standardization with the 12-cylinder V-2. However, before the start of the war, Plant #75 did not undertake its serial production. Also in 1940, Plant #185 completed development of diesel engine #744. The primary feature of this engine was that it totally replaced the standard engine of the T-26 tank. This was a 4-cylinder, 4-stroke, water-cooled diesel with a nominal output of 150 hp at 1700 rpm. The diesel was intended to initially equip the T-26-1 tank and derived combat vehicles during the planned sweeping modernization of the 1941-1943 period. However, its production was not undertaken in 1941; during the course of the war not one engine plant that attempted to organize its production was able to assure the supply of fuel pumps, and consequently could not produce the engine itself. Practically all the initial designs of the SP-Gun that were undertaken during the war, were looked upon as universal artillery assets for the support of tank units or infantry, oriented primarily at combating enemy tanks. These were, in large part, the inexpensive "tanks without turrets" that could be produced in large numbers on existing equipment with available resources. In the fall of 1941, Plant #174 began producing a tank-killer based on T-26 components, especially from those T-26's that required repair. It was recommended that the turret and armament be removed, and install the 76 mm F-32 gun> (produced by the LKZ) in an armoured superstructure on the hull. The design was accepted for construction, but the subsequent rapid evacuation of the Izhorskiy, LKZ, and Voroshilov Plants halted work on this project. On 3 March 1942, the NKTP, on the initiative of the recently appointed Chief of Special Bureau of OGK NKTP, S. Ginzburg, embarked upon the creation of light SP-Guns. In the preliminary design, the Special Bureau recommended the use of a unified chassis for the SP-Gun, from components of the T-60 Light Tank and cargo trucks. However, a "Hetzer-like" vehicle did not emerge from this combination and the NKTP did not return to the design of the SP-Gun until the fall of 1942. As L. Gorlitskiy said, "We had enough other work at the time." "1. To have the lowest possible silhouette (desired on the basis of the average height of a man). 2. To employ the most inexpensive components of mass production of light tanks, cargo trucks, and prime movers. 3. To have the possibility of mounting serially produced truck engines, as the power plant, from among those easily manufactured by our industry. 4. To have the least possible number of crew, not exceeding 3 men. 5. To have an armament capable of penetrating armour of 50 mm and greater thickness at a range of 500 metres. 6. Frontal armour should ensure the reliable protection of the SP-Gun from 37 mm anti-tank guns at all ranges of effective fire. The sides and rear should protect the crew from large-calibre machine gun bullets, light anti-tank rifles; and fragments from shells, boms and mines." The Design Collectives NII-13, Bauman MVTU, NATI, TsAKB, Uralmash, and also subsidiary enterprises from NKTP (Plant #592, OKB #38, and a number of others) were included in the work on this SP-Gun project. In the summer of 1942, NII-13 presented a preliminary design package of several variants of the tank killer on a chassis made from components of the T-60 and T-70 light tanks. The designs of three of these vehicles differed from each other primarily in armament alone. The unique feature of these SP-Guns was an armoured hull of low height constructed from sheets of rolled armour plates of 35 mm (front) and 15 mm (sides and rear) thickness welded together. The armour had shallow slope angles providing sufficient protection for a small crew (3 men in a standard SP-Gun or 4 men in a command model) from the fire of the German 37 mm anti-tank gun and 50 mm tank gun with the 42-calibre barrel; the most common guns in the German Army up to the second half of 1942. The engine and transmission were borrowed from the ZiS-5 truck, with a recommendation that its output be increased to 108 hp by supercharging. It was interesting that the relatively small size of the fighting compartment should not cause the crew to become fatigued during prolonged travel. The hull roof could be opened sideways, which opened the fighting compartment from above and provided additional sides. These additional sides served as additional protection for the crew from projectiles and shell fragments, while on the move. The first I13.73-SU vehicle was armed with the 45 mm high velocity gun developed by NII-13 in 1941, which was similar to the M-42 45 mm Anti-Tank Gun later accepted for service. The second vehicle, designated I13.75-SU, was armed with two coupled 45 mm gun of the same type as in the first vehicle. 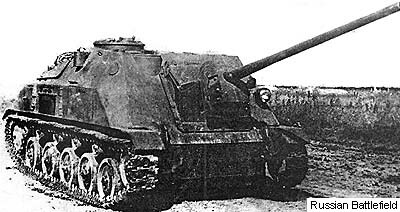 The third vehicle, designated I13.76-SU, was armed with the 76 mm "self-propelled" gun with a 50-calibre barrel, which had been reconfigured by NII-13 from the F-22 divisional gun. It was recommended to equip all artillery systems with a "special forked-shaft lightened frame" with anti-fragmentation shield and telescopic sight. The designs were evaluated at a session of the Technical Council of the NKV and in October 1942 the TsAKB was engaged for development of the artillery components, and OKB-33 and KB NATI were engaged for development of the drive train. The re-worked SP-Gun designs were presented for assessment by the higher leadership in December 1942. 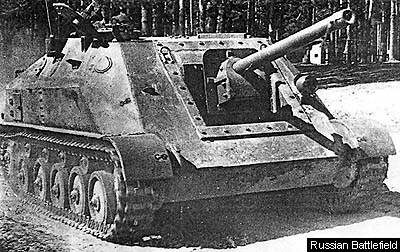 J. V. Stalin personally very much liked the vehicle equipped with the 76 mm gun, calling it "extremely interesting." By instruction of the GOKO of 16 January 1943, the NKTP and NKV recommended that test models of two combat vehicles of NII-13 be prepared and delivered for testing by 15 February. These vehicles received the designations SU-IT-45 and SU-IT-76 (samokhodnaya ustanovka - istrebitel tankov [self-propelled tank killer] respectively with 45 mm and 76 mm guns). In January 1943, it became clear that there were difficulties with the production of the supercharged ZiS-80 engine, and the twin-engined GAZ-203 power pack installed in the T-70 tank could not be installed in the engine compartment of the new vehicles. The engine compartment and transmission had to be redesigned. True, it was anticipated that soon either the Plant "Dvigatel Revolutsii" ("Engine of the Revolution") or the Yaroslavl Plant would master production of the V-3 diesel or #744 engines, which were in high demand to equip light tanks, SP-Guns, and artillery prime movers. The employment of a diesel with an output of 150 to 250 hp at 1700-1800 rpm. would permit an increase in armour thickness of up to 45 mm (front) and 25 mm (sides and rear) on the SP-Gun. However, the new diesels were not forthcoming, because in 1941-42 these plants were seriously damaged during German air raids, and also were experiencing a severe shortage of qualified staff. The production of American diesels of 110-160 hp in the USSR, under license, had also not yet begun. Therefore, it is understandable that the SU-IT-76 design, more than once reconfigured for various engines, was not completed on time. In addition, the capture near Leningrad and subsequent testing of the new German Tiger I tank demanded from the designers of the SP-Gun that they consider improving its armament. Upon recommendation of the Chief of the TsAKB, V. Grabin, they mounted the simplified 57 mm S-1-57 gun, with ballistics of the ZiS-2, in the vehicle. Calculations showed that a simple exchange of barrel with the new SP-Gun was not sufficient. The design of some of the mount components had to be modified. Therefore, the preparation of a test SP-Gun was halted until the correction of these identified deficiencies, and a new time schedule was agreed upon. In the fall of 1943, the armoured hull of the uncompleted tank killer was sent to the Moscow branch of NII-48, where it was used at the end of the war primarily as a target for testing new captured armour-piercing ammunition. From the fall of 1943, NII-13 did not re-start work on the creation of an antitank self-propelled gun, though several times over the years it attempted to force its "stepchild" to accept it for service. Following in the tracks of the designers of the NKV, to create a special light tank killer, came the designers of GAZ, headed by N. Astrov. In the summer of 1943, at the NATI Design Bureau they prepared two designs of armoured SP-Guns, designated on the list of the NKTP as "turretless tank killers GAZ-74." These two SP-Guns differed in the layout of the combat compartment. In the first vehicle, - GAZ-74a - the combat compartment was part of the hull of the vehicle, as in the GAZ-71, and already accepted for service SU-12 (better known as the SU-76), which improved distribution of weight of the SP-Gun on the road wheels and raised its manoeuvrability; , admittedly at the price of a relatively high large silhouette and vehicle weight. The second variant (GAZ-74b), was similar to the SU-IT-76, recommended by NII-13. The vehicle had a low silhouette, was well-armoured (45mm glacis plate) with sloped armour and was armed with the 76 mm S-1 Gun (the same gun was mounted on the serially produced SU-76i). The new tank killer was to receive the GMC-71 diesel engine. The GAZ-74b was built, underwent factory testing, and on the whole was approved by military personnel. Under the designation SU-76-I (not to be mistaken for SU-76i) or SU-74 it was subjected to government tests. However, in 1943 the arming of these vehicles with the 76 mm gun with a long barrel (41-calibres) was already considered inadequate for combat with heavy German tanks. The cost significantly exceeded the that of the SU-76, which was already being mass produced. Therefore, the fate of the GAZ-74b was sealed. In the summer of 1943, Gorkiy Artillery Plant #92, at the behest of the Chief of the TsAKB V. Grabin and with the support of D. Ustinov, renewed the production of the ZiS-2 57 mm anti-tank gun, and also its ZiS-4 tank variant, which had been halted at the end of 1941. These guns had very good armour-penetration characteristics. This situation once again spurred designers toward the creation of an anti-tank SP-Gun. Already in early August 1943, an SU-57 vehicle resembling the mass produced SU-76M with an SU-15-57 57 mm anti-tank gun mounted in place of the standard 76 mm gun, had left Plant #38 for factory testing. As a result of testing, the SP-Gun was not recommended for acceptance into the Army's inventory. In the first place, it turned out that the recoil length of the 57 mm gun exceeded the norm agreed to by the customer. In addition, the military were motivated to reject the SP-Gun because, in their opinion, a tank killer should have an enclosed armoured hull with shell-proof armour and a diesel engine. On 29 October 1943, the attendees of MVTU also suggested the design of an armoured tank killer that resembled both the I-13.75-SU and the GAZ-74b. It was recommended that it have a weight of not more than 11 tonnes and receive the GMC-71 diesel engine or the USSR-produced equivalent, the production of which was being actively discussed. The vehicle was to be armed either with the S-1 76 mm gun or S-1-57 57 mm gun. The crew consisted of three men. Despite the fact that all formal military requirements were satisfied by the design, no instructions for its production followed. At the same time GAZ stubbornly continued work on its tank killers. Parallel efforts were made for the creation of a new vehicle, the GAZ-74b with the S-1-57 57 mm long-barrel gun, as well as improving the vehicle by fitting a 76 mm gun (the developers awaited a S-54 high velocity 76 mm gun with 60-calibres long barrel from TsAKB). In order to differentiate between the GAZ vehicle (with the 57mm gun) and the SP-Gun from Plant #38; the former was designated SU-57b and the latter SU-57a, on the NKTP list. The SU-57a (an SU-76M re-armed with the ZiS-2 gun) was already undergoing tests. Despite the fact that the SU-57b passed almost all the recommended tests, it was not accepted for service. Among the reasons for it not being accepted, was the high cost of the SP-Gun and the necessity to produce a new diesel engine that had not been assimilated by Soviet industry (the higher authorities would hardly deem it reasonable to rely on foreign deliveries during wartime). The NATI Design Bureau contributed to the creation of a domestic tank killer. Apparently taking into consideration the work on the GAZ-74, they developed their own variant of the turretless tank killer. It is interesting that the paper design went under the title "hunter" (for comparison, the Hetzer in German was a "jager"- a hunter, one who went out hunting animals). When this tank killer was ready, armed with a 57 mm gun, it underwent testing. However, this vehicle also did not receive the required engine, and differed little in its combat characteristics and price from the GAZ Plant models, which were actively being promoted at all levels. They tested the vehicle and modified it several times, but it was still not accepted for service. Work to modernise the GAZ-74 that was undertaken in 1944, which led to an improved SP-Gun designated GAZ-76d, or SU-76d ("diesel"). True, the S-54 gun was not ready for it, but the front sloped armour was increased to 60 mm and in this form, with the S-1 76mm gun, was tested at the Government Trials under the designation SU-80. It was again not accepted for service, because of the lack of clear superiority over the mass produced SU-76, and the use of the imported diesel. Production of imported diesel had not been assimilated either in Yaroslavl or in Miass factories, nor in the Gorkiy Automobile Factory (GAZ), which had been subjected to repeated bombing in 1943. "Thus, German experience of tank destroyer construction shows that the use of small-scale turretless tanks in modern war has fully justified itself. The comparison of a German turretless tank of the "osa" [although in Russian "osa" sounds like "wasp", this time it means abbreviation from "Obshevoiskovaya Samokhodhaya Artilleriya"- All-Purpose Self-Propelled Artillery - V.Potapov] type with the SU-57b from the Gorkiy Factory, which has a similar chassis, shows some advantages over our own vehicle associated with the use of the diesel engine. The mounting of a defensive machine gun on the roof of the tank, with the possibility of conducting fire from behind armour, should be considered a real plus. Among the deficiencies of the SU-57b are the absence of powerful fragmentation or high-explosive fragmentation rounds for the gun." In the course of 1943-44 works on Soviet "coffins" proceeded to their logical conclusion. This is understandable, because tanks with 85mm guns, whose projectiles possessed greater armour penetration capability and more powerful high explosive effects, were already accepted for service. However, the primary reason for failure to accept these vehicles for service was, that the requirement for equipment of such clear defensive capabilities was not so acute as it had been in 1941-42. In the closing moments of this episode, the Gorkiy designers created yet another self-propelled tank destroyer, the GAZ-76, which became - as it were - the last crowning achievement among Soviet "Hetzers." It is interesting that, with a combat weight of not more than 18 tonnes, the GAZ-75 carried frontal armour of 75 - 90 mm thickness (the mass produced SU-85 had 45 mm) and was armed with the same 85 mm gun as the T-34-85 and the SU-85. The positioning of the combat compartment in the middle of the SP-Gun improved the weight distribution on the road wheels and improved the vehicle's mobility on cross-country terrain. The good transmission of the SP-Gun made it exceptionally mobile, both on hard-surface roads and off roads. However, this SP-Gun also did not accept for service. In 1945, a large quantity of uncompleted design material relating to future types of military equipment was being worked on in fascist Germany fell into the hands of Soviet forces. Among this material was a very interesting project named the "Hetzer Starr." This design differed from the standard Hetzer by replacing the original gun mounting by one rigidly mounted in the hull. In the opinion of the German designers, this permitted the abandonment of anti-recoil devices, economy of interior space in the combat compartment, and also somewhat increased the rate of fire of the main gun. Our own specialists also considered the low production cost of this system as a real advantage. Therefore, in 1945 the decision was made to create a special design group made up of German specialists for the study and delivery of a design for possible use by the Soviet Army. This SP-Gun design was completed in 1946 and, by some sources, led to the development of a test model. It is interesting to note that M. N. Shchukin (main designer of OKB-38) was one of the chairmen of the mock-up commission of this department. Work on the SP-Gun was halted, because the 75mm anti-tank gun was clearly already insufficiently powerful to combat enemy tanks. The employment of a more powerful gun was problematic, because of the effect of its recoil on the drive train and hull of the SP-Gun. The more so, because the high power recoilless gun had by this time appeared. "Artilleriskoe Vooruzhenie Sovietskih Tankov", Armada-Vertical #4, 1999.